Radio listeners received a boost Tuesday, when a powerful new broadcasting satellite for Sirius XM Radio successfully blasted off from Kazakhstan to beam programming to receivers in cars, boats, airplanes and homes. For the next 15 years, Sirius FM5 will supplement and expand the company's radio service to customers across North America. The new satellite is the eighth spacecraft in the company's fleet, which now includes four Sirius satellites and four XM craft. 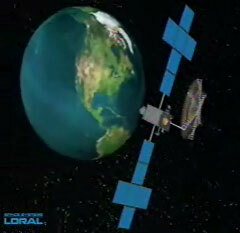 The fleet was consolidated during the 2008 merger of the two satellite radio pioneers. "Sirius FM5 is going to be a tremendous step forward in our service," said Robert Briskman, Sirius co-founder and technical executive. "It will provide two important new capabilities. One is higher availability of service to our customers, which means better service. And (it will) also be a spare in orbit, which will improve the reliability overall." The Sirius FM5 satellite blasted off aboard a Proton rocket at 1910 GMT (3:10 p.m. EDT) from the Baikonur Cosmodrome in Kazakhstan. The 12,831-pound satellite rode off the launch pad on nearly 2.5 million pounds of thrust produced by the Proton's six first stage engines. The rocket shed its first stage two minutes later, giving way to the launcher's second stage for a burn lasting about three-and-a-half minutes. The single-engine third stage took over for its firing and the Proton jettisoned its payload shroud during the sixth minute of flight. The third stage separated from the Breeze M upper stage about ten minutes after liftoff, ending the Proton's role in the mission. Officials with International Launch Services, the U.S.-based firm overseeing commercial Proton flights, confirmed the Breeze M completed five burns to push Sirius FM5 closer to its home in geostationary orbit along the equator. The Breeze M was expected to place the spacecraft in an orbit with a high point of 22,236 miles, a low point of 2,614 miles, and an inclination of 22.9 degrees, according to pre-launch projections. The rocket deployed Sirius FM5 at about 0424 GMT (12:24 a.m. EDT), ending the 9-hour mission. 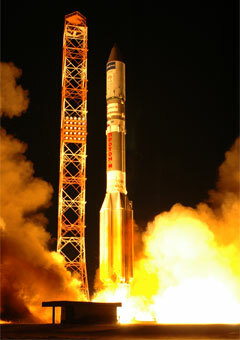 ILS declared the launch a success, concluding the Proton's fifth flight this year. Sirius FM5 is the fourth satellite the radio broadcaster has launched on Proton. The company's three earlier spacecraft, all launched in 2000, operate in high-altitude elliptical orbits over the Earth's polar regions. "Our partnership with Sirius goes back many years; ILS has launched all of the Sirius satellites," said Frank McKenna, ILS president. "It is an honor to be entrusted, once again, with the expansion of their satellite constellation, with the advanced technologies that the powerful Sirius FM5 satellite will provide." Sirius FM5 will be positioned in geostationary orbit at 96 degrees west longitude, becoming the company's first satellite to be stationed there. "It will provide radio-quality signals down to the continental U.S., Mexico and Canada," said Lincoln Day, executive director at Space Systems/Loral, the builder of the satellite. Sirius FM5 is based on Loral's 1300 satellite platform, which will produce 20 kilowatts of power at the end of its 15-year design life. Officials describe the craft as the most powerful digital audio satellite in space. "This spacecraft is a backup and a replacement for the three Sirius satellites that are already in orbit," Day said. "It will improve the quality of the services that are currently being provided and will also provide robustness for the constellation in case anything were to happen with the original three spacecraft." Sirius FM5 carries an unfurlable reflector almost 30 feet in diameter. The antenna will be connected to an X-band uplink and an S-band downlink communications payload. The giant reflector, tightly folded at launch, will allow the satellite to transmit signals to the small terminals used in the vehicles and homes of millions of customers. The next ILS Proton launch is scheduled for early August with the AsiaSat 5 communications satellite. That mission will be followed by the launch of Canada's Nimiq 5 spacecraft in early fall, officials said.